Stuffed peppers make a quick and easy dinner, and I usually have ingredients on hand. I’ve started to write about stuffed peppers four times now. Nothing worked out. The peppers just didn’t inspire me, even though they made a fine dinner in a hurry. I can’t blame our current snow and ice on being uninspired. I first made these back in early December. One note of caution: I wish I had made two peppers instead of three and stuffed them to overflowing. We had one left over, however, that we threw into a pot of spaghetti sauce the next day. Now that added some flavor. Preheat the oven to 350 degrees. Trim a little bit from the base of each pepper so it sits flat. Cut the top off each pepper; remove and discard the ribs and seeds. In a medium frying pan, mix the beef and pork with the onion, garlic, oregano, parsley, salt and pepper. Add the tomato paste. Place the peppers in a baking dish. I coated the bottom of the dish with olive oil. Stuff the meat mixture into each pepper, filling almost to the rim. 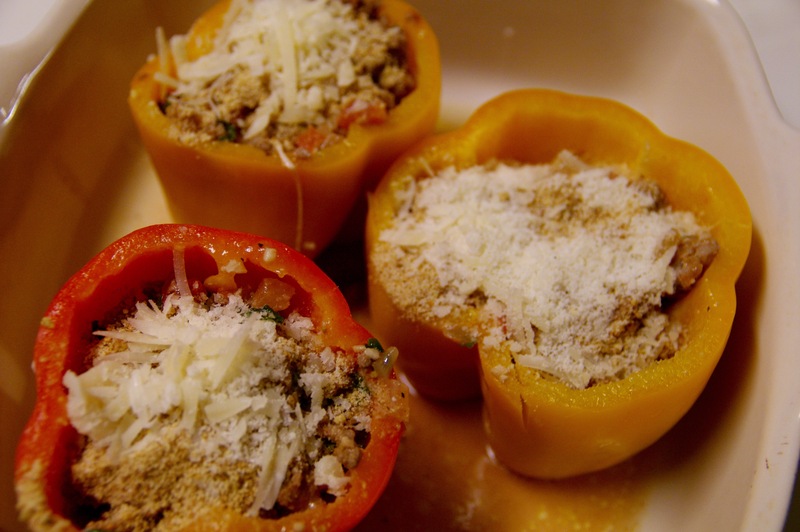 Garnish each pepper with cheese and bread crumbs. The amount depends on your preference. Bake until the peppers are tender and the meat is fully cooked, about 20 minutes. Serve immediately.